The things I've done are in bold. 2. Slept under the stars ahh good times -- slept outside almost every day during the summers as a kid -- but mostly when we slept outside, it was on the porch, so it wasn't technically under the stars! 4. Visited Hawaii -- ahhh I wish -- someday! 5. Watched a meteor shower funny story -- When we were dating, Steve took me to a trail head at the top of North Ogden canyon, and we watched the meteor shower in the back of his dad's truck -- when a van pulled in by us -- a few minutes later and we started hearing some very...uh...amorous...sounds coming from the van -- very loudly! We got so uncomfortable that we left before the meteor shower was over! 7. Been to Disneyland -- so fun! I can't wait til Grayson is old enough to go! 8. Climbed a mountain -- I live in Utah. Duh. It's pretty much mandatory. 10. Sang a solo lots of times! 16. Had food poisoning yuck. 17. Walked to the top of the Statue of Liberty -- someday! 18. Grown your own vegetables -- used to when I was little! 19. Seen the Mona Lisa in France -- much smaller than I imagined, but of course beautiful! 21. Had a pillow fight --Ok seriously if you haven't had a pillow fight you might not be human. 22. Hitch hiked -- ohh no -- I would be too freaked! I'd walk before I hitched! 25. Held a lamb -- ahh, I wish! 28. Ridden in a gondola in Venice -- someday!!! That is like my ultimate dream vacation! 30. Watched a sunrise or sunset -- again, DUH. 32. Been on a cruise -- so fun! I want to go again! 34. Visited the birthplace of your ancestors -- oo, that'd be fun! 37. Had enough money to be truly satisfied -- of course I'm satisfied -- I have a good life! But of course it's human nature to always want more. 50. Been to the top of the Eiffel Tower in Paris -- AND got kissed there!! Ahh yeah! 51. Gone scuba diving or snorkeling -- too chicken to scuba. I stay on the top of the water, and even then my heart races the whole time. I won't dive in the ocean. I have an intense fear of deep water. I'm weird, I know. 52. Kissed in the rain -- ahh so romantic! 54. Gone to a drive-in theater -- ohh good times! We need to go again! 55. Been in a movie -- do student films in high school count? 64. Donated blood, platelets or plasma -- try to as often as I'm eligible. 65. Gone sky diving -- AWESOME!!! I really want to go again! 70. Visited the Lincoln Memorial -- much bigger than I imagined! 71. Eaten Caviar -- yuck. nope. 77. Broken a bone -- never! never even had stitches! I'm such a wuss. 79. Seen the Grand Canyon in person -- beautiful! But actually, I'm more awed by Arches National Park and the other red rock parks. 82. Bought a brand new car -- I love my Ruby Sue the Subaru!! 85. Read the entire Bible -- actually, no! Wow, I'm horrible! I HAVE read the whole Book of Mormon, numerous times! 86. Visited the White House -- seen it from outside the gate! 90. Sat on a jury -- they cancelled the trial the one time I've been called! YAY! 91. Met someone famous -- I've met Alan Menken (the composer for a lot of the Disney movies' music), Maura Tierney (she's on ER), and a few others, but I can't really remember -- no one really super-famous. 94. Had a baby -- yay! This was probably the best experience on this list!! 96. Swam in the Great Salt Lake -- but it's really gross walking over all the brine shrimp. And it stinks. 97. Been involved in a law suit -- not a law suit, but I have had to go to court -- over my doggie. I'm still annoyed by the whole thing. 98. Owned a cell phone -- wow, that's a stupid one. 99. Been stung by a bee -- of course! Anyone that played outside as a child has been stung by a bee. What a weird assortment of questions. 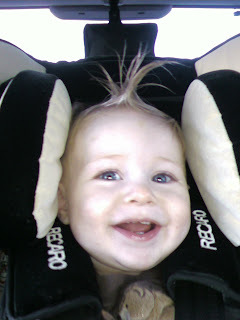 I leave you with a funny/cute picture of my baby in his carseat. He's happy to be facing forward so he can FINALLY see what's going on :) Gotta love that smile. And the hair! How much! Lincoln has the same carseat (different color) and I love it! I like it way more than our Britax. Those things are overrated. That was fun to read. Italy is my dream vacation right now too!! What a fun list of questions! Loved remembering about the whole Eifel Tower thing. Too funny! And thank goodness for kids are music so we can get some cultural experiences in our lives. Good times! You went to London - England - land of your ancestors ! so WOW - you really have accomplished so very much at your young age ! WOW - I am impressed. How are we even friends?! and your husband too you have quite a few swimmer friends. JK-totally kidding, really I am! But seriously you have anxiety in water and I would be happy to be a fish and spend all my time in the water, scuba diving is the most exciting thing I've ever done-so fun!